I have to confess, I had been neglecting to post on A Maui Blog not because I have nothing to talk about, but because my perfectionist tendency is kicking in. You see, I wanted to come up with several “pillar posts” – some awesome posts that I can put on the side bar that will attract readers to read more. Posts like – “Where do Locals Eat”, “10 Activities I Highly Recommend” and so on. But for me to write those “awesome posts (ahem)“, I need some time when I can concentrate and do it without interruptions (yeah, I am like that). But life is busy so I can’t find those uninterrupted moments. This morning when I woke up I decided to shake off that perfectionistic tendency and told myself I should just “talk story” freely to get this A MAUI BLOG going. Otherwise, it’ll get stuck once again like it had been in the past. So here’s what’s on my mind, what’s happening in my life on Maui and what’s keeping me busy these days, or some future plans I have. Prepare for a long post. Or maybe not. Let’s just talk story – please leave a comment so I won’t me talking story to myself. JOURNEY CONCERT ON MAUI – I am so excited, Journey is holding a concert on Maui! On March 24, 7:00Pm at the MACC’s Amphitheater. They started selling tickets to the MACC members last week, but today is the start of selling tickets to the public. I am not going to miss this! You see, I like the Journey’s songs, and I also am touched by the story of Arnel Pineda. I talked about him on my other blog – here, here and here. Here’s the link to the Maui News article for more info. There’s also a discussion going on in this forum that you might want to participate. THE SOUND OF MUSIC – I am an avid fan of the musical, and the film, THE SOUND OF MUSIC. Truth be told, I had watched the The Sound of Music DVD more than 25 times already. I have sung “the hills are alive” a thousand times (ok, hundred) and I thought my kids the “do re mi” song as soon as they can speak. My kids and I used to sing the whole sound track of The Sound of Music in my car. Be glad you are not there. I do not sing. I sing out of tune. But that does not stop me from “channeling” Maria Von Trapp – I love singing her songs! Anyhoooo, the reason why am talking story about The Sound of Music is because there’s going to be a stage show of it this weekend at the Iao Theater! You bet I’d be there. Yes, with my kids! Pray that I don’t start singing while watching. People get annoyed when other people do that. My husband would disown me. God help me restrain myself. Oh, I am so excited to watch this on stage. Click here for more info. Maybe I’d see you there. STEM PROGRAM, KIHEI CHARTER SCHOOL – Last night I attended the Informational Meeting for the Kihei Charter School. Hapa Boy is now in 5th grade and I an hoping to get him into the STEM Program for his middle school. There were tons of people in the meeting. They would be holding a lottery because there are more people interested in the school than the slots open. I pray my son would be picked in the lottery. It’s the best school setting for him. He is very interested and talented in science – this school is a perfect fit. For more info in the STEM program of Kihei Charter School, click here. WHALE DAY AT KALAMA PARK – I planned on doing a separate post on the “successful” Whale Day but didn’t get a chance (yep, blame it on that perfectionistic procrastination again). The long and the short of it is that it was very successful. Lots of people. Lots of good food. Lots of great music. And lots of fun. One of the highlights is meeting Kris (@webnelly) and his wife Cindy who are my twit friends from Chicago and are visiting Maui. We also met with Dave (@raats) and Brenda (who is fun to talk story with). There you go. I think this is good enough to break the silence of the blog (I noticed I had two Wordless Wed post in a row). I really want to post daily so when I am slacking and not doing it, would you please give me a nudge? Thanks and Aloha! 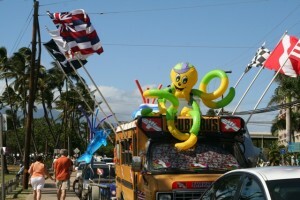 * This post is my entry to the Homespun Honolulu’s Carnival of Aloha. Hi there Liza — as far as your first paragraph — I feel exactly the same way. It’s often hard to define what exactly we’re doing with our blogs. It looks to me, though, that you did quite well with this post once you got going. Simply doing without thinking sometimes is what we need to do. I just love your very informative Maui blog! 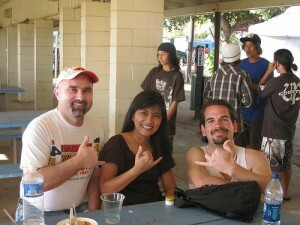 We really enjoy following the Maui Entertainment scene, and have done so for years. We especially love the musicals and like you, Julie Andrews was my idol when I was in my teens. I would walk the mile to my job in a little tea room (we lived out in the country in BC Canada) and pretend I was Julie Andrews. (I have her first name at least) I would belt out all the songs from the Sound of Music, secure in the knowledge that noone could hear me. We are looking forward to attending the Maui production soon!!! I will look forward reading your future blog posts. Regarding your first paragraph I am the same way. I can’t write anything if I am distracted. Our computer is in the family room so I have to either stay up late to write or get up at 3 am. I found it easier to get up at 3am to write in my blog. But it does make me extremely tired! We’re all always looking for that pillar post, Liza. If we could all just let go and “talk story” with our readers, those posts would come in time, I think. Thank you for sharing with us!